Walter Richard Whitehurst was born on April 11, 1964 in Shreveport, Louisiana. The tall six foot three right hander, was drafted by the Oakland A’s in the third round of the 1985 draft. Whitehurst came to the New York Mets in huge three team trade involving the Oakland A's & Los Angeles Dodgers in December 1987. 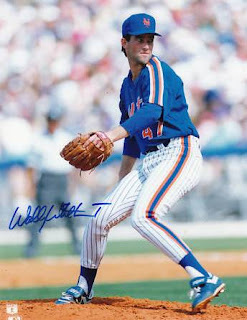 Both Whitehurst & Kevin Tapani came to the Mets, as long time Mets reliever Jesse Orosco, along with Alfredo Griffin & Jay Howell went to the Dodgers. Bob Welch & Matt Young both landed in Oakland. In 1988 Whitehurst was 11-10 with a 3.05 for the Mets at AAA Tidewater, (tied for second with John Mitchell) behind Dave West for most wins. Whitehurst then went 8-7 with a 3.25 ERA the following season for the Tides. His best pitch was his sinking fastball, although it too was not over powering. He made his MLB debut at Shea Stadium in July 1989 in a game against the Houston Astros. He allowed two runs in one inning pitched of relief. earning no decision in the Mets 6-0 loss. On July 19th he was roughed up for four runs on nine hits, pitching just 2.2 innings of work at Wrigley Field taking a loss to the Cubs. Overall he went 0-1 in eight appearances posting a 4.50 ERA, getting credit for one hold. In 1990 he was mostly used as a middle reliever, third on the staff in appearances (38) going 0-1 with two saves. He only walked nine batters in 66 innings pitched, striking out 46. In 1991 he became a starter, behind a solid rotation of Dwight Gooden, Frank Viola & David Cone. 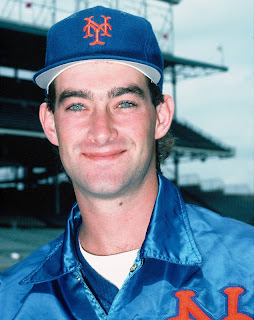 He earned a win in his first start on April 6th beating the Montreal Expos at Shea Stadium as he allowed just two runs in seven innings of work. He was used both as a starter & reliever early on going 2-1 with two holds in the month of May. He was 5-4 on the 4th of July before going on a six game losing streak, not earning another victory until early September. 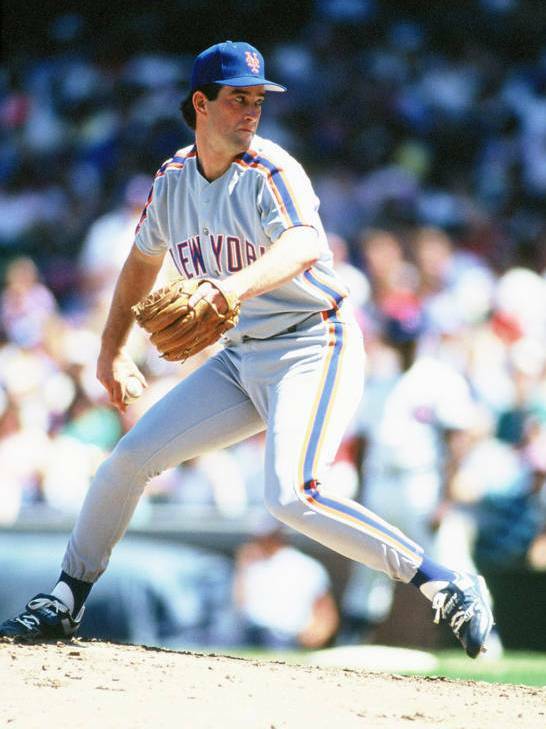 Overall in 1991 he started twenty games for the fifth place Mets going 7-12 with a 4.18 ERA. 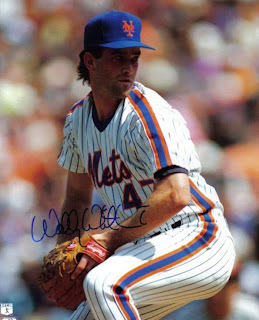 Wally pitched in a career high 144 innings with 87 strikeouts. Unfortunately he had the third most losses on the staff and was summoned back to the bull pen by September. In 1992 he saw the most action of his career, pitching in 44 games, getting 11 starts. In April he blew a save against the St. Louis Cardinals but was bailed out by Eddie Murrays walk off HR. Later that week he blew a Dwight Gooden 4-3 lead over the Phillies in Philadelphia taking the loss. From June until late August he lost five straight decisons although his ERA was just above three. It was a rough year for Whitehurst all along going 3-9 with a 3.62 ERA in 97 innings pitched. At the end of the 1992 season the Mets sent Wally and DJ Dozier to the San Diego Padres for Tony Fernandez & a player to be named later. In San Diego he would go 8-14 over the next two seasons making 34 appearances. He spent the 1995 season pitching for four different teams (Giants, Red Sox, Blue Jays & Expos) all at the minor league level. He would make the AL New York club in 1996 but only pitched in two games finishing the year back in the minors. Lifetime in seven seasons he finished up 20-37 with three saves & a 4.02 ERA. He walked 130 batters and struck out 312 batters in 487 innings pitched in 163 appearances. Retirement: Since his playing days, Wally had been a minor league pitching coach & manager. He also has worked as a substitute teacher at his old high school in Louisiana. He recently was working as a salesman for a local oil field company.